Do you ever feel like you are sleepwalking through life? You continue with your regular routine where you go to work, come home, make dinner, pay your bills, breathe, eat, sleep, brush your teeth, shower, rinse and repeat. It feels like a normal routine, but it takes so little thought that you are basically sleepwalking through life. You know you did things today, but you can’t even remember what it all was. How did I get home? Did I eat lunch today? What did I have? I feel like I’m forgetting something. Oh yeah, it is my life! I probably should not be telling you this, ruining my Contagiously Positive Girl image by admitting how imperfect I am, but I have found myself ignoring life. But hey, I’m just a regular human being, not a positivity robot, but that had been me for months – sleepwalking through life. Almost one year ago to the day, in April 2016, I just stopped. My husband and I unexpectedly got relocated back to our hometown, which was a happy/sad/bittersweet/exciting/scary change. I took a hiatus from my business, I stopped going to yoga, I stopped regularly eating healthy, I stopped meditating – I just stopped. It didn’t feel like it mattered at the time. I was somewhat happy, felt healthy-ish. I had good excuses, like I was taking the time to say goodbye to friends, sell a home, buy a home, pack up a home, drive 3500 km to my new home, unpack a home, and get settled into my new life. However, overtime, once the honeymoon phase was over, I found myself out of excuses for the continuous zombie-like routine. I didn’t know what I should do, where should I go, what my new life was suppose to be. I struggled to get back into a healthy routine of exercise and healthy eating. I struggled with clarity in my business. I couldn’t meditate (or rather, didn’t want to). This wake-up call terrified me. I had stopped for so long that I basically seized up. I wanted to cry (okay, I did cry) because I know better than to let myself get stuck in Negative-Ville. But, I’m only human and I believe that is was necessary for me to learn, grow, change and evolve. Many things contribute to sleepwalking or just stopping life: grief, pain, disappointment, lack of clarity, or the dark unknown, unfamiliarity of change, which is what happened to me. Here is the thing, change is challenging for many of us, even if you don’t want to admit it. It can paralyze us because when we don’t change, we can stay on autopilot. Autopilot may work for some, but it definitely was not working for me. I had become unhappy, without even noticing it, and I’m the Contagiously Positive Girl, unhappiness is just not the autopilot that I want to be stuck on. So I made a choice. I woke up one day and awoke to my life – my new life – my amazingly imperfect, what do I do now life. It is now a year later and I still don’t have all the answers, but here is the thing, you will never have all the answers. The most important thing is that I was fully awake, aware, ready and willing to step back into my CP Girl authentic self. The great thing about change (and life) is that I get to create what I want. I could have stayed sad about the life I left behind, or be frustrated about being unsure what the new changes would bring, or make up new excuses, but I decided that was going to take in the blessing and be grateful that I get to push the reset button and start again. That is what change does. It gives us the opportunity to push the reset button on our life and take a deep look at what is working and what is not working, deciding what we are going to let go of and let it go, deciding what we want, where we want to go, and who we want to be. The great thing about life is that if you wake up tomorrow, you get to push the reset button and choose again, course-correct and recalibrate. How amazing is that? You don’t have to wait until a major life shift occurs to make positive changes. You can do it today. I have this new deeply rooted knowingness that we (me) (you) need to accept that life is happening for us, not to us. If you are feeling like I was, sleepwalking through life, unsure what do, where to go, what to say or how to start, just start today with one baby step. Do not worry about tomorrow, next week, next month, or next year. We never have any idea what the future is going to hold. There is no crystal ball (if you have one, I will pay you big bucks to see it). The next step that you (me) take may not be the right steps, and we may have to recalibrate again, but that is the fabulousness, scariness, awesomeness and excitement of life. If it doesn’t work we get to push the reset button and choose again. What happened in your life to make you stop? What can you do today to wake up? 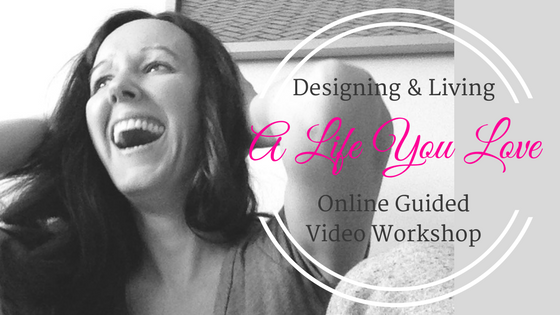 How can you start to make life happen for you, instead of waiting for it to happen to you? When tomorrow arrives, what is the second step, third step, and fourth step? You get the point. If what you choose doesn’t work, just push the reset button and choose again.